21st July, a long and tough B-day party! I went to sleep at the Arctic circle age 37 and woke up being 38, great place for a b-day. The road that Ivana had spotted had a name, which is always bad news. It was called the ‘Beaver Slide’ which could be pleasant in different contexts, but in our case it meant 3km of steep uphill cycling at a 10% grade. 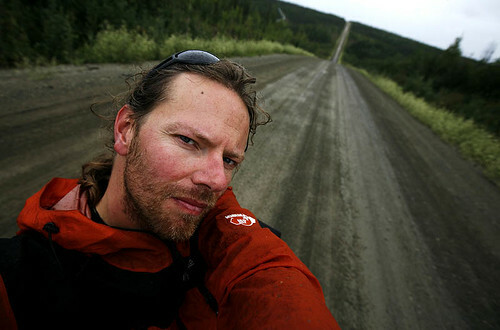 The asphalt had ended, so we were back on mud and gravel and the returning rain made it even more difficult. The rain and hills did not stop all day but still we were in a good mood. Just when we thought we had enough hills, we entered the area which was called ‘The Rollercoaster’ and it deserved its name. We had been warned beforehand by some people as the big trucks cannot slow down on these hills and cannot avoid us well. In order to get up the next hill, they have to go full speed down, else they will not make it. Well, on a fully loaded bike you cannot go down at full speed as you will break it, so we usually start braking at about 50km (30mi)/hrs speeds when on the mud and gravel as there are potholes everywhere. This means that we cannot make it back uphill, and many times we had to get off the bike and push it up. You lose all sense of time when it doesn’t get darker at night. The sun doesn’t set at 70 degrees North, but just circles around you like a vulture above a fresh kill. As we do not have watches, only our cycle computers and Lenny could tell us what time it was. The other cyclists were buys packing as they were on the 08.00 tour, but as our tour only started 6 hours later, we enjoyed the extra hours to relax for the first time in weeks. 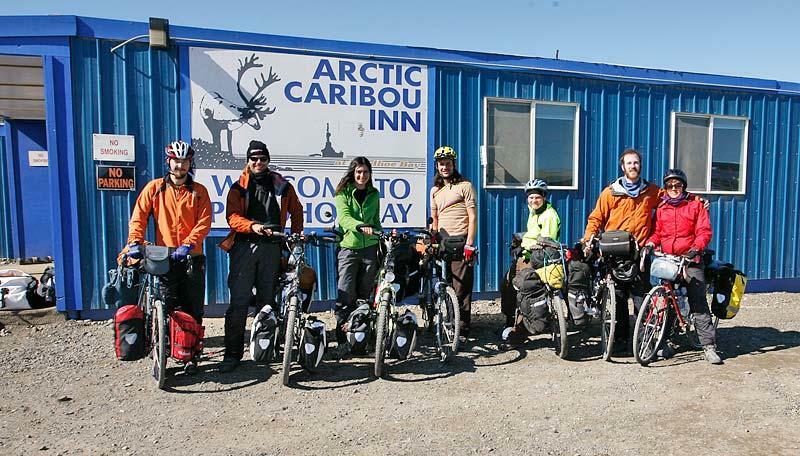 When we finally headed over to the Caribou Inn, they had already finished and were preparing for their trip. As a biketraveller, you have to take care with your money, as you never know where you might need it. That is why we were hesitant to attack the $18 lunch buffet that the cyclists had raved about. Once we took our group picture outside and said goodbye to the others, we had made up our mind to feast; but we were too late as lunch was over. Again, we had no sleep, but our bodies seem to have gotten used to that by now and anyway, it doesn’t get dark here! We left Ericka’s place at about 4.30 in the morning as we wanted to be sure we would arrive in time and cycled through the empty streets of Fairbanks. It is strange but nice to be in a place where it never gets dark, it makes many things so much easier. 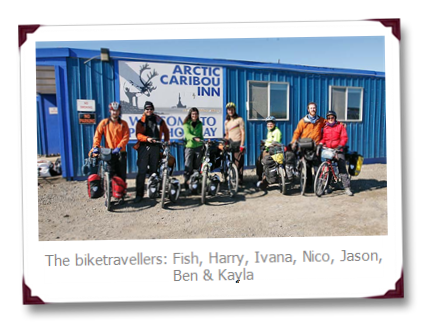 We cycled past the airport until we found the office of the Northern Alaska Tour company. We were welcomed by a bunch of very friendly people, who were all interested in our trip. They mostly do trips to the Arctic circle and places like Wiseman & Coldfoot, but also regularly all the way to Deadhorse. Our driver was Michelle, a great girl with much knowledge about everything. she had been driving the roads for many years and was a joy to talk to. Our other passengers were Dan & Curt. Dan was a politician, working for Condoleezza Rice -so unemployed soon- going to his family’s cabin ear he Yukon River.